We are ambling through what is essentially an 18C rustic village. We are on land that was once owned by Edward Alleyn, the 16th century actor and co-owner of the Rose Theatre on Bankside. Retiring early, Alleyn founded at Dulwich a set of almshouses for the poor and a college for twelve poor boys. The almshouses and chapel survive at the heart of the village and the l9C Dulwich College, one of our finest public school, stands proud nearby. 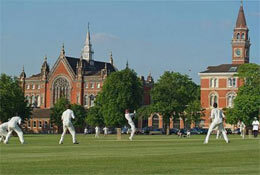 Its ownership of much of Dulwich explains its unspoiled nature. We visit the quaint old Pond Cottages built for the workers of the clay pits; walk past the glorious park, see the tiny and ancient village shops, and then to one of the real attactions of Dulwich Village – the first Picture Gallery in London. And on our way back to the station we pass the fields where farmers used to graze their cattle, past one of the lovely 18th century houses with its gardens leading down to the River Effra. It is time out of time – and then it is time either to stay on for a drink in one of the old pubs or for afternoon tea, or catch the train back to London.